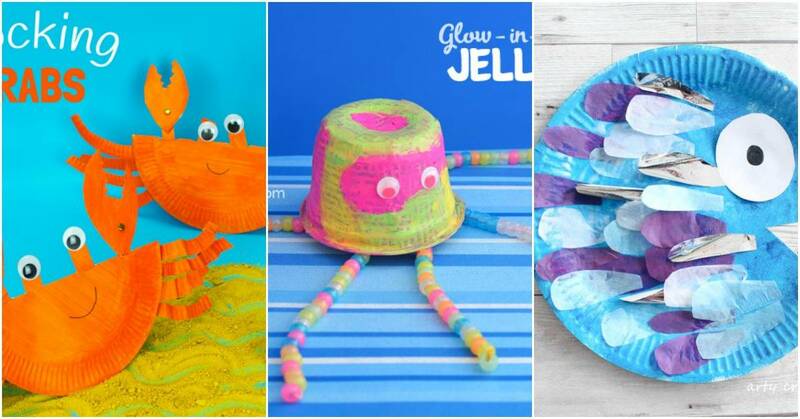 Whether you’re planning a trip to the beach or just dreaming about one, this collection of adorable ocean animal crafts is sure to be a hit with your kids this summer! Shark Drinks | Turn your child’s juice box into a silly shark with this quick and easy tutorial. Bubble Wrap Jellyfish Craft for Kids | Combine bubble wrap, googly eyes, and pipe cleaners for this fun craft. Paper Roll Octopus | This fun fellow will spark your kids’ imagination and lead to some fun pretend play. Cereal Box Aquarium | Save this one for a long rainy afternoon. 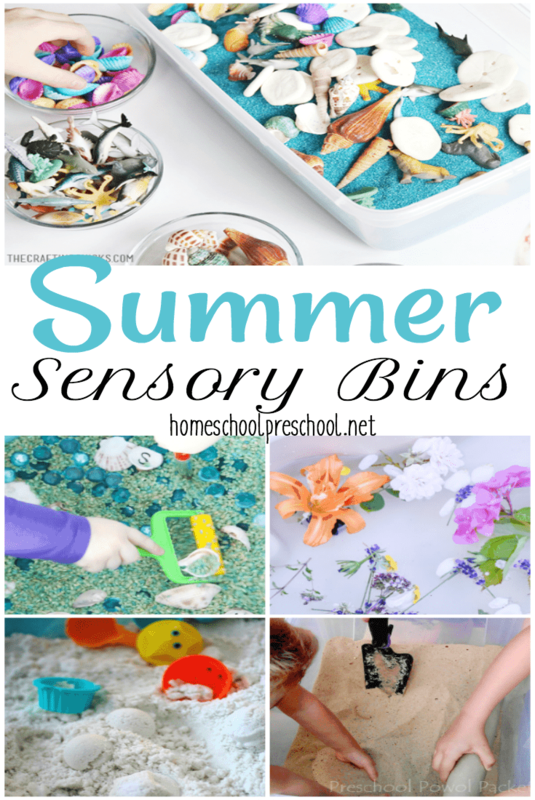 It’s sure to keep kids occupied for a while creating and designing their own aquariums. 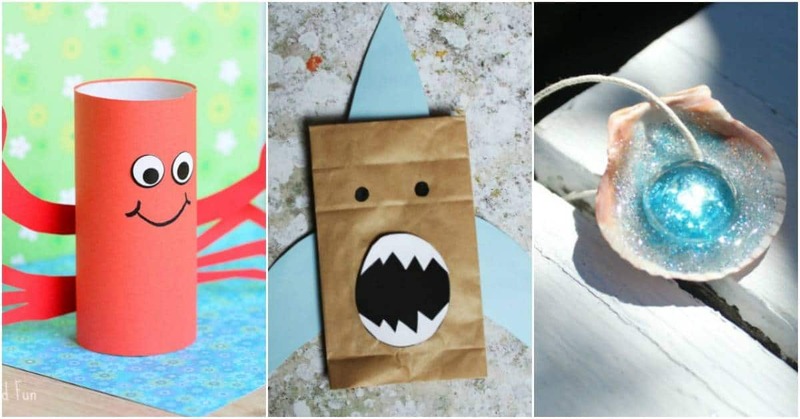 Paper Bag Shark Craft | Perfect for Shark Week or anytime! Bottle Cap Fish Art | With some old bottle caps, construction paper, and glitter glue, your kids can make a whole ocean of bottle cap fish this summer! 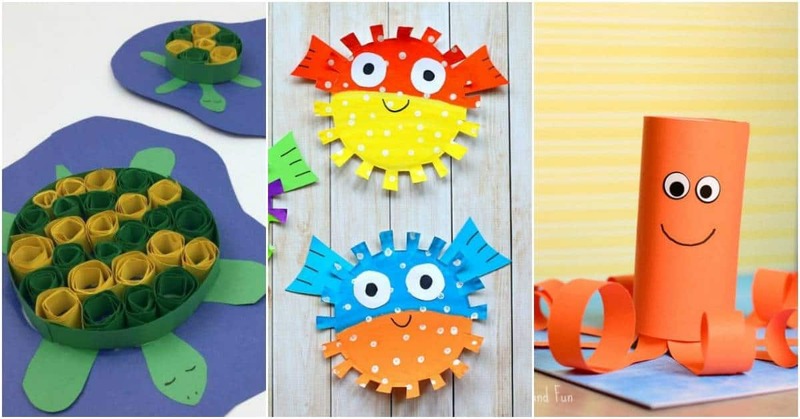 Paper Plate Pufferfish Craft for Kids | I, for one, think pufferfish are cute. And, these paper plate pufferfish are at the top of my summer crafting list! Quilling Turtle Craft | Little ones will work on their motor skills as they work to create these cute turtles. Paper Roll Crab Craft | This little crab is so cute. He reminds me of Sebastian from The Little Mermaid. Glow-in-the-Dark Jellyfish | I don’t know a kid that isn’t excited about things that glow in the dark. They’ll be begging to make this jellyfish and then hiding out in a dark space to watch him glow. Newspaper Shark Craft | I love the combination of the bright blue papers with the muted gray of the newspaper. How clever! Rocking Paper Plate Crab Craft | These adorable crabs rock back and forth and have pincers that actually open and close! 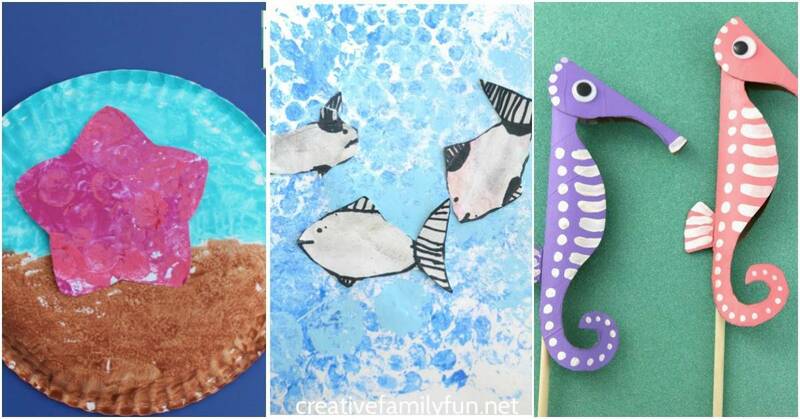 Paper Plate Rainbow Fish Craft | Preschoolers will work on their fine motor skills as they paint, cut, and paste their way to a beautiful rainbow fish! Coffee Filter Jellyfish Craft for Preschoolers | The coffee filter base gives this jellyfish a beautiful tie-dyed look. Mermaid Necklaces | Seashells and glitter glue (and a couple other simple supplies) combine to make a beautiful mermaid necklace your preschoolers will wear all summer long. No Mess Fish Canvas Art | If you’re looking for a mess-free craft for your preschoolers, you have to check out this awesome fish painting based on the book Bright Stanley. 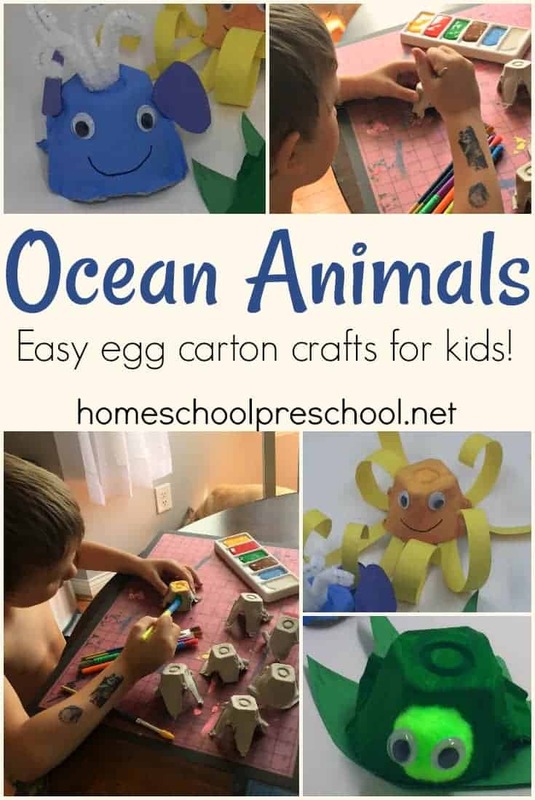 Ocean Sunfish Paper Plate Craft for Kids | Here’s another fun paper plate fish for your preschoolers to try! Starfish Texture Art | I love everything about these starfish! Starfish Paper Plate Craft | Your kids can create their own beach scene with this project. Jellyfish Discovery Bottle | If you’ve ever visited the aquarium with your kids, I’m sure you’ve seen the jellyfish tanks. Kids can create their own with this discovery bottle. 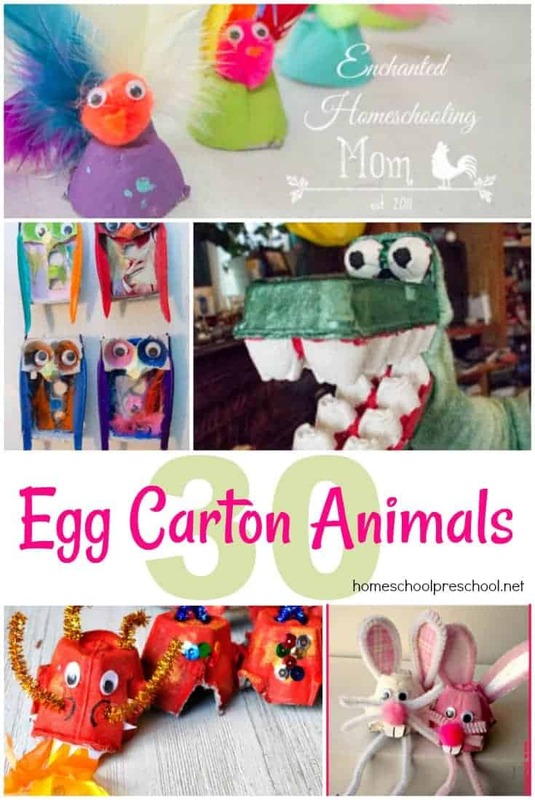 Paper Roll Seahorse Puppets | Your kids will love making these seahorse puppets and then using them to act out stories this summer. Pelican Paper Plate Craft | This may be the only pelican craft I’ve ever seen, and it’s adorable! DIY Mermaid Tiara for Kids | Do you have a little mermaid fan? She’ll love this mermaid tiara! How to Make a Whale Collage | I love that these kids worked together to make a huge, multi-media whale collage! Recycle Plastic Bottle Turtle | Follow this tutorial to create a sea turtle out of an old plastic soda bottle. 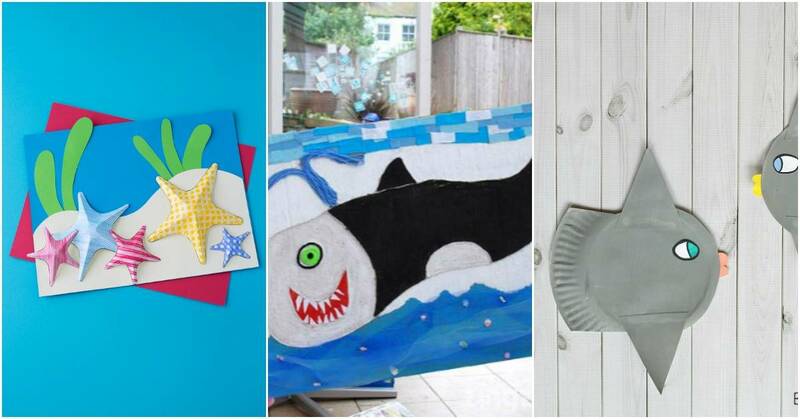 Layered Paper Art Underwater Scenes | This multi-step art project is perfect for spreading across several rainy summer afternoons. 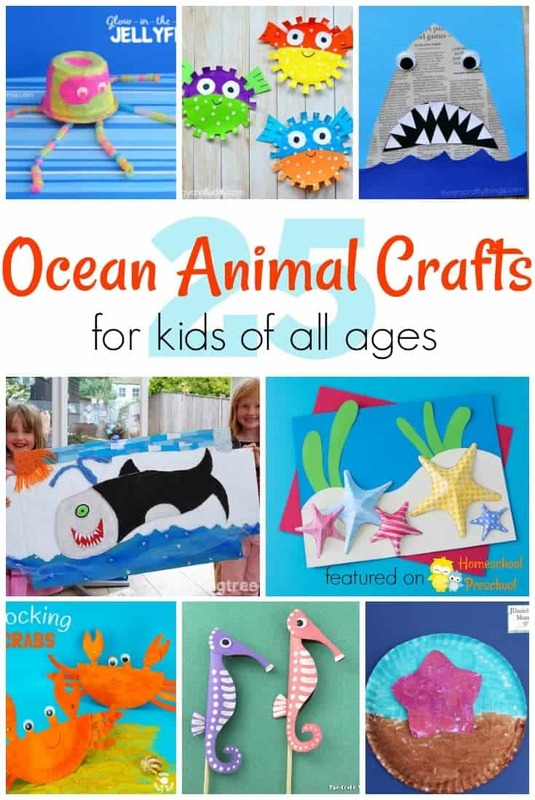 With 25 amazing ocean animals crafts for kids, how will you choose where to start? Leave me a comment letting me know which one you plan to try first.